It was a cold Saturday morning in a hospital in San Francisco and I was huddled on a desk, silently cursing the winter chill. I wasn’t supposed to be at work that day. The department was eerily quiet, too bright with all of the fluorescent light panels on. And then from a corner of my inbox, I noticed an email from Seth Godin that has illuminated my life since then: his interview with Krista Tippet, host of the podcast On Being. I’ve been a fan of Seth for some time now, religiously devouring his daily emails (you should really subscribe if you haven’t), books, interviews and classes. Seth’s humbling brilliance, punctuated by Krista’s insightful wisdom stunned me. The hour flew by. Even though I was unfamiliar with Krista’s tone and style, it was easy for me to slide into the show’s rhythm. That interview made me a Krista fan, as I relished episodes wherein she conversed with luminaries I’m both familiar and unfamiliar with: Pico Iyer, Maria Popova, Alain de Botton, Paul Muldoon, David Whyte, Elizabeth Alexander. It wasn’t until later, after ten episodes or so, that I finally started to grapple the depth of the show; I slowly felt its impact within the inner workings of my own being. What is striking with these conversations is that although Krista’s guests/partners are not necessarily spiritual nor religious, she is always able to take them to a field where the heart, spirit and soul meet, bringing her listeners with her. Each episode always leaves me feeling a little more grounded, embracing the length of being human even more. 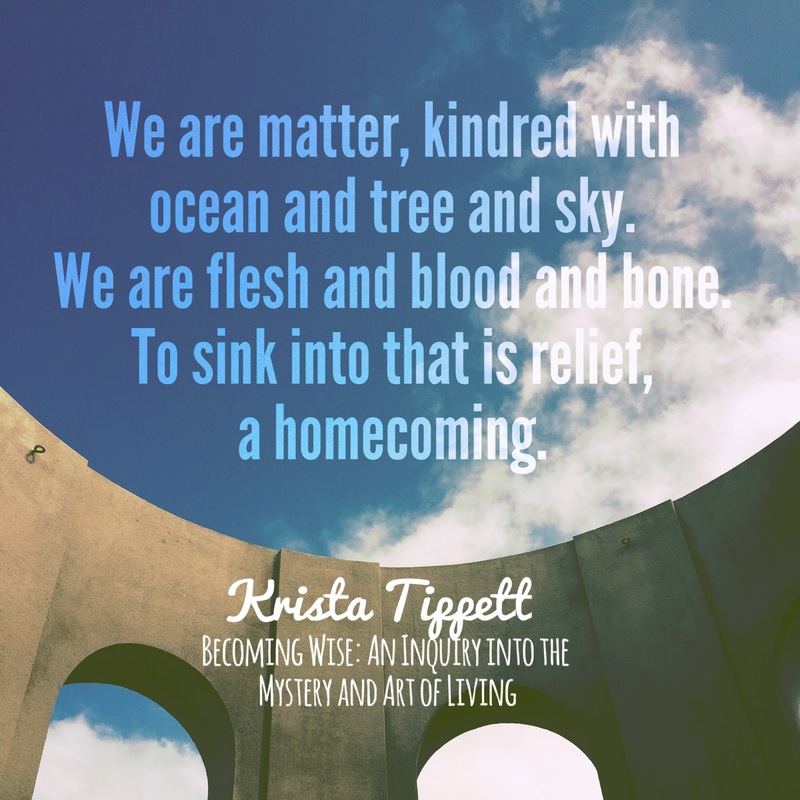 As soon as I found out that she was releasing a book, I knew that Becoming Wise: An Inquiry into the Mystery and Art of Living would be just as generous as Krista was (also Seth’s words in the interview). Ash Wednesday came early this year. It was supposed to be about preparation, about consecration, about moving toward Easter, toward resurrection and renewal. It offers us a chance to break through the distractions that keep us from living the basic Easter message of love, of living in wonder rather than doubt. For some people, it is about fasting, to symbolize both solidarity with the hungry and the hunger for God. I started reading Anne Lamott’s Small Victories: Improbable Moments of Grace a day after Good Friday. The day was “Black Saturday,” a day of mourning for Catholics. It’s that in-between time after the death of Jesus and his resurrection the following day. The day before, I was still finishing up my post on Ed Catmull’s book and my mom casually asked if I still went to church. I didn’t have a better answer than “I’m not practicing” so that’s what I said. Dammit. That was a lie, followed by Catholic guilt. For a long time I considered myself an atheist, not believing in God/dess or a higher power. I always questioned his/her/their existence, having witnessed a lot of suffering as I grew up. As I got older I became agnostic and eventually, I turned to Buddhism, finding its teachings and practices a much more suitable fit for the person I want to be. For the person I try to be, instead of feeling bad that I hadn’t followed my parents’ religious footsteps. I was learning the secrets of life: that you could become the woman you’d dared to dream of being, but to do so you were going to have to fall in love with your own crazy, ruined self. Can Buddhism & Activism Ever Co-exist? The wave does not need to die to become water. She is already water. On my 29th birthday, some gifts to myself: saltwater, deep presence and a connection to the world around me. I was finishing reading Thich Nhat Hanh’s (Thay, as he is referred to endearingly) You Are Here as this day came and it couldn’t have been perfect timing. As one gets older, certain things become clearer. In an age when social media and the connection it provides is prevalent comes a time when one feels even more distracted, frustrated and worse, isolated. These things have prompted me to challenge and question not just how we consume social media but ultimately, how we spend our days. After all, writer Annie Dillard said it best: how we spend our days is how we spend our lives.